This research extends previous findings related to the positive influence of company credibility on a social Cause–Brand Alliance’s (CBA) persuasion mechanism. This study analyzes the mediating role of two dimensions of company credibility (trustworthiness and expertise) with regard to the influence of altruistic attributions and two types of brand–cause fit (functional and image fit) on corporate social responsibility image. A structural equation model tests the proposed framework with a sample of 299 consumers, and the results suggest that (1) image fit and altruistic attribution are cues that consumers use to evaluate company trustworthiness when linking to a social cause; (2) functional fit significantly influences perceived company expertise but not trustworthiness; and (3) trustworthiness has more weight than expertise in judgments about corporate social responsibility. 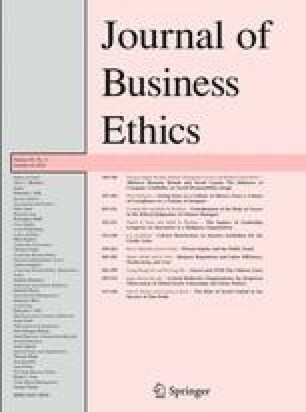 Sparks, J. and Y. Pan: 2009, ‘Ethical Judgements in Business Ethics Research: Definition, and Research Agenda’, Journal of Business Ethics. doi: 10.1007/s10551-009-0092-2.